Exams finished (I’ve been exercising my brain cells by doing some data analysis and computer courses with the UK’s Open University), so I have at last had a chance to blog. 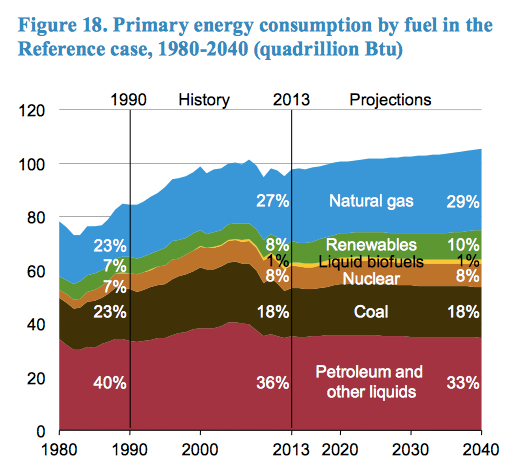 Let’s kick off with a report I usually try to catch each year: the US government’s Energy Information Administration (EIA)‘s “Annual Energy Outlook 2015“, which looks out to 2040. US oil production has pushed up toward 10 million barrels per day (bpd) and is a whisker away from overtaking Saudi Arabia; five LNG export terminals have been approved and are under construction because the US is so awash with natural gas (due to the fracking boom) that it needs to export it; solar PV panel price falls coupled with efficiency gains have brought the levelised cost of solar PV down so substantially that solar energy is now making a major contribution to electricity generation in an ever-growing number of American states; Texas has become a wind-energy king second only to Denmark; and Elon Musk is bringing power to the people (literally) in the form of a new generation of home super batteries.